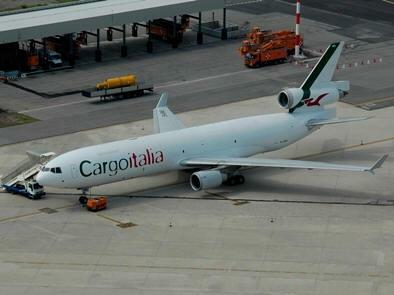 June 13, 2010 – The Boeing Company is supporting the expansion plans of Cargoitalia S.p.A. by providing the Italy-based, all-cargo operator with its third MD-11 freighter under a long-term lease. Boeing Capital Corporation, the company’s aircraft financing arm, structured the deal for the newly completed MD-11 Boeing Converted Freighter (BCF), with Boeing conducting the modification work at its subcontractor facility in Singapore. Following its acceptance by Cargoitalia, the aircraft flew directly to the operator’s main base at Malpensa Airport here, where it awaits entry into service. The new BCF joins two other MD-11s leased from other sources in the carrier’s scheduled and charter service operations from Italy to the Middle East, Asia and North America. Cargoitalia expects to put it into service on its emerging Milan-Shanghai route beginning in July. “We are very pleased to add an aircraft with the increased quality and capability of the new MD-11 BCF to our fleet. It will be a fundamental tool for developing our cargo network and putting our growth strategy into place,” said Giacomo Manzon, Cargoitalia managing director. Since ALIS Italian Airlines purchased the company in 2008, Cargoitalia has seen a complete turnaround of its operations including almost all of its management and a re-launching of its brand. “Our fleet plan has been a key factor in this, and we are very happy with the performance of the MD-11 freighter. We are considering further fleet development and continue to work on refining our plans and operations, based on one of the most modern freighter models available,” Manzon said. Compared to earlier MD-11s freighters, the new BCF features an updated flight deck and cargo-handling system, better fuel efficiency and increased operating capabilities. It carries a 205,400-pound (93.2 tonne) structural payload at a range of 3,486 nautical miles (6,456 kilometers) at 630,500 pounds (286,000 kg) maximum takeoff weight. The main and lower deck cargo compartments hold a total of 36 96- by 125-in. pallets or containers. The MD-11 freighter is the leader in the 90-tonne freighter class, with some 175 aircraft in active service at well-known cargo operators and freight forwarders worldwide including FedEx, UPS and Lufthansa among others. Boeing Capital has a number of newly converted Boeing freighters on lease to operators including recent customers Aeroflot and Ethiopian Airlines. A sister MD-11 now undergoing conversion will be available for placement later this year. "From a financier’s perspective, investment in a MD-11 freighter conversion is a great move in terms of the aircraft’s residual value. It takes a strong aircraft asset beyond its role as a passenger carrier and extends it to a new cargo-focused life, maximizing its value in the process,” said John Kent, Boeing Capital senior director for Europe. Overall, Boeing has converted more than 100 MD-11 passenger airplanes to freighters.